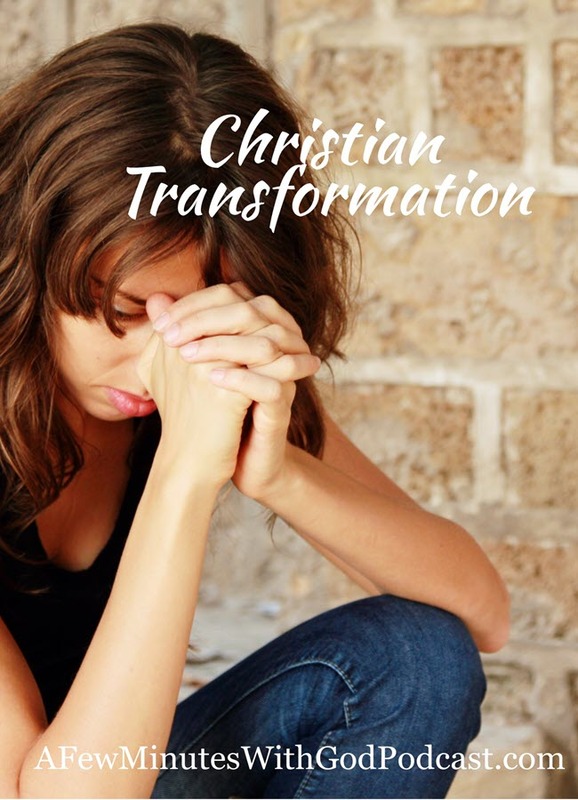 Have you had a Christian transformation in your life? God sent His only Son so that we might live an abundant life and in this podcast, we will explore Christian transformation and look at the ways that we can apply this to our life. We witness the power of God’s love in the Bible. If you have not made it a habit to read Scripture every day be sure to add it to your list! You can listen to my last podcast Prayer and Routines here. We all have some type of life transformation but it might not be in the spiritual sense. It might be weight loss or gain. It might be an addition or loss in your family. Transformation can cause us heartache but when we are transformed by the power of God’s word it can be life-altering. When we read about the baptism of Jesus in the Jordan River we are astounded once again by God’s love. Jesus is an example of becoming poor to make us rich. John himself said he was not worthy to even tie his sandal, yet Jesus asked to be baptized. God’s love is transforming, read: Isaiah 40:1-10 … We read, “A voice of one calling: In the wilderness prepare the way for the Lord; make straight in the desert a highway for our God. This is a foreshadowing – a prophecy about the coming of John, the voice calling in the wilderness, and it was written when the Israelites were living in exile. At times we can relate to the Israelites. In this time we live of divisive politics where right is wrong and wrong is right. We are dismayed if we watch the news for any length of time and find ourselves frustrated no matter what side you are on. We hold on to this promise to the Israelites that the God of Isaiah is also our God and He knows what we struggle with on a daily basis. Paul also writes to Titus that through Baptism and the Holy Spirit, we can become heirs in hope of eternal life (Titus 3:..-10) and I’d love for you to pull out your Bibles and read this directly, it is as if God is speaking to us today. Isn’t that amazing? We lived in malice and envy being hated and hating one another … but with the KINDNESS and love of God our Savior appeared. And, friends that is what we must live for, we have Christian transformation when we focus on the fact that he saved us not because of righteous things we had done, but because of his mercy. This is true transformation. Trusting in God. Knowing that we are justified by grace and we have the hope of eternal life. Who else gives us this hope? Our family. No. The people we work with. No. The friends we surround ourselves with. No. The only person who gives us eternal hope is the same one who died on the cross, for our sins, so that we can have this promise. John promises that Jesus would baptize with the Holy Spirit and with fire. This baptism after the life, death and resurrection of Christ set into the motion the baptism of the Holy Spirit upon the disciplines and in a sense to us, and this baptism of fire is what is transforming in our lives. The Holy Spirit was sent to transform us. The Holy Spirit is the third person of the Trinity. One God, three persons, Father, Son and Holy Spirit. This God we serve is an amazing God and ready to help us in our daily trials. If we have been baptized we have transformative power of the Holy Spirit within us and for that we should shout, Halleluiah and praise the Lord! God is within us and we only need to ask for His saving grace in our life. Dear Lord, I come to you sinful and sorrowful and I ask first that you forgive me of the sins I have committed today … I ask that you bless me with your restorative love and infill me with the Holy Spirit. Bring me to a deeper union with you, my God. Help me to see you in everything. Help me to be thankful each day no matter what the circumstance. I thank you for your promise of everlasting life and a true transformation that only comes with belief in Christ. I praise you and I thank you, my God. Thank you for giving me your Holy Spirit, thank-you for deepening my love for you, thank-you for infilling me to overflowing with the grace to do Your will each day, and I praise you in Jesus Name, Amen.